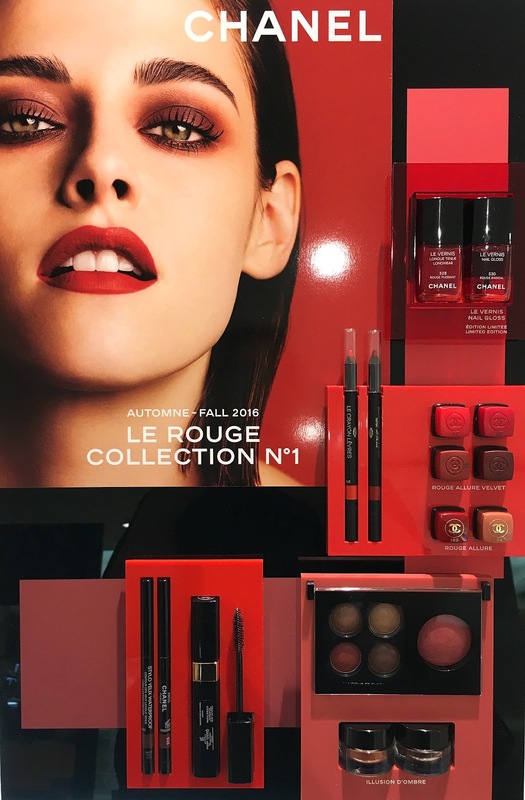 The first collection from new creative director of makeup, Lucia Pica, Chanel's Le Rouge Collection No.1 recently launched in a shower of flame, showcasing 'the many facets' of their iconic red. Another fairly tight and compact collection, I can't wait to share my thoughts, and of course as always, my swatches of the range. Let's hop in! Le Rouge Collection No.1 is a sumptuous palette of autumnal shades, circling around red and it's complimentary tones. It consists of a eyeshadow quad, a blush, 2 Illusion D'Ombre eyeshadows, 6 lipsticks, 2 lipliners, 2 eyeliners and 2 nail polishes. Joues Contraste Blush in 320 Rouge Profond £28 | I really love Chanel blushes. It's no secret that No.21, Alezane and the almost obnoxiously bright shade in their summer palette are amongst some of my very favourites of all time for example. I love their more bright or dark shades as the formula is so exquisite, you can really blend them out for the most beautiful, flushed look, so Rouge Profond is a definite win. A strawberry, rosy red-pink with signature, subtle golden shimmer, sheered out it just looks like you've been for a jog on a frosty morning. Stylo Yeux Waterproof £19 | I love the formula of these in general, and always pick up a limited edition colour when a special one comes around. 928 Eros is a beautiful, purpley-aubergine shade with golden shimmer - I'm so drawn to this kind of colour so it's hard not to love. 929 Agape is cool toned dark brown with golden shimmer that doesn't excite me as much. It's limited edition but the colour feels a little ordinary and too easily dupable so it's a pass. Les 4 Ombres in 268 Candeur et Experience £40 | I know this seems to be selling out everywhere, and I've seen many other bloggers gush about it, especially over Instagram, but to me, this palette is just ok. Yes the shades are soft and silky, matte but not powdery and very easy to blend, but there's no intense pigmentation and I find the neutral shades a bit boring and sand-like. The red in the palette is beautiful - a deep, dusty, brick red shade that I think would look pretty amazing fluffed into the crease, but would I pay the premium for that one shade? Arguably not. Illusion D'Ombre in 128 Rouge Brule £25 | I was really disappointed with the shades of the Illusion Ombres in Spring, as vivid blues and greens just aren't colours I wear, and Summer 2016 didn't have any at all so I've been dying for some new, more neutral shades to come out! Rouge Brule does not disappoint, and definitely quenches my thirst. A beautiful, pigmented, metallic copper with subtle shimmer, it's no New Moon but it's really up my street nonetheless - although if you picked up the Sable eyeliner from Summer 2016, it swatches almost identically, so no need to have both. Illusion D'Ombre Velvet in 132 Rouge Contraste £25 | I definitely overlooked this at first, in favour of the more shiny (#magpie) Rouge Brule, but Contraste is actually a gorgeous, deep, intense brown with a slightly purple undertone. The colour and pigmentation is so rich with this one, it's clearly been expertly formulated. Rouge Allure Lipsticks £26 | Coming in two new shades, 168 Rouge Ingenue is a creamy, midtoned beige with peachy undertones. The pigmentation and texture is nice and even, with a creamy sheen, but for me this is far too pale, I get a bit of the dreaded 'concealer lip', mannequin look, so personally one to avoid. 169 Rouge Tentation is a rich, raspberry red with cool/blue undertones. This one is gorgeous, it's nicely pigmented without being over the top, comfortable on the lips and the colour is supremely flattering. 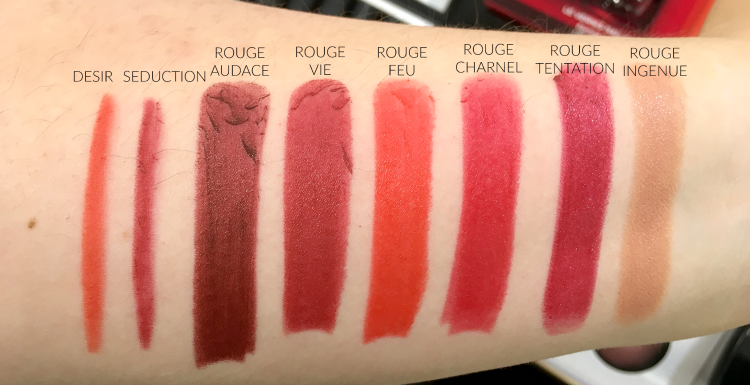 Rouge Allure Velvet Lipsticks £26 | I'm not a matte lipstick lover as my lips tend to dry out so easily, but the formula of these almost-mattes impresses me. They've got an elegantly smooth pigmentation and texture, a good colour payoff and feel surprisingly comfortable on the lips as they don't really dry past a satin finish. 56 Rouge Charnel - a medium-dark, pinky red with cool, strawberry undertones. 57 Rouge Feu - a vivid, orange-red. 58 Rouge Vie - a more muted, plum-red and probably my favourite of the bunch, this one's gorgeous. 59 Rouge Audace - a dark, vampy burgundy, with brown and wine undertones. Le Crayon Levres £17.50 | Handily, Chanel have brought out two lipliners to match two of the Allure Velvet lipsticks. These have a good texture, somewhere in between creamy and firm and are strongly pigmented. 97 Desir is a perfect match for the orange-red of Rouge Feu, and 98 Seduction, for Rouge Vie. Le Vernis £18 | 528 Rouge Puissant is the signature Chanel, true red with neither a cool nor warm undertone. I adore the formula of Chanel's polishes and this is no less brilliant than normal. With rich, creamy pigmentation that needs just 2 coats to look like deep, intense perfection, it settles on the nails to a glossy, shiny finish. 530 Rouge Radical Nail Gloss is a tomato-red jelly gloss polish that I absolutely love! Although it's called a gloss, and you might think it's a top coat, the polish is actually surprisingly opaque, and you can get it almost fully opaque with 2 coats. I love this, although I'd have preferred it out with the summer collection, as the shade of red is definitely more summer than fall. Overall, I'm giving the collection a big thumbs up. 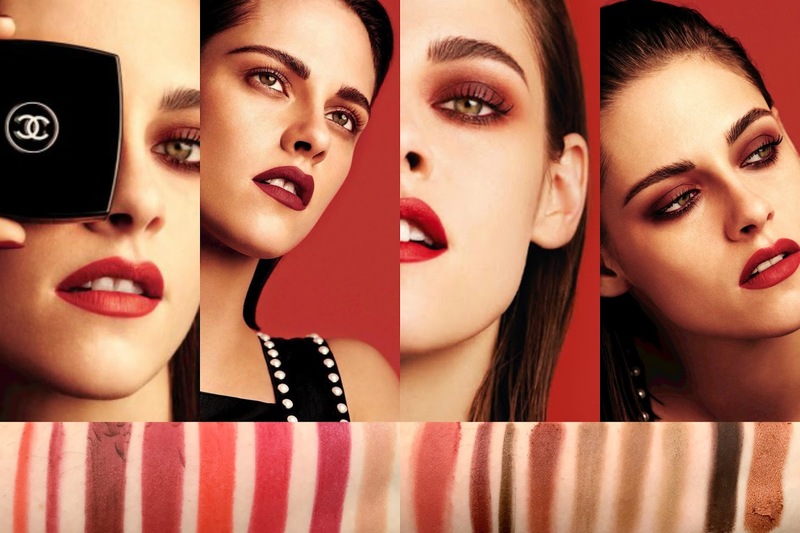 The textures and formulas are as exquisite as ever, something that really keeps me hooked on Chanel as a brand, and the colours are stunning for autumn/fall and so up my street. Have you tried anything from the collection? Thoughts? P.S Have you seen my Sultry Summer Date Night Makeup?? Wow Rouge Brule is gorgeous! Your swatches make it look really bronze, but I've seen it quite orange... so it's put me off from buying it. I might look at it in person this weekend and see if I like it or not, but I'm definitely getting more from this collection after loving the eyeshadow quad. So gorgeous! The Rouge Brûlée eyeshadow is going right on my wish list - stunning! You have the most crystal clear explanation, and honest humble opinion which I seek. Im so grateful that you have a good and detail swatches. I swear, keep up your good work.